Alma Gourmet Squid Ink. Price per 90gr jar. Nero di Seppia can come from almost any cephalopod and some sources are squid, cuttlefish, octopus... 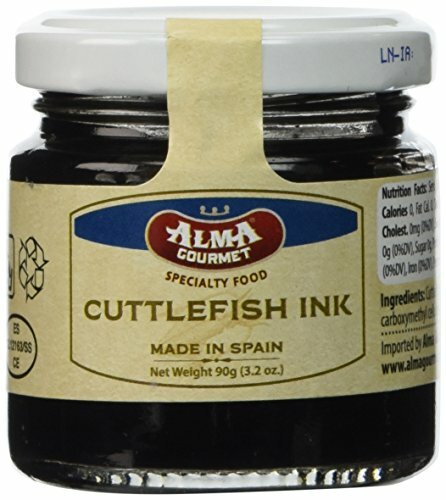 The ink from Cuttlefish is used as a food coloring and flavoring, providing a very dark black color and a slightly salty tasting flavor to foods such as pasta or risotto. Some popular dishes include squid in squid ink, spaghetti in squid ink, squid ink risotto, Squid Ink Paella... Squid ink is most popular in Italy and Spain, and it's unique appearance and origin make it a gourmet delicacy in many other countries. Squid ink is very low in calories and is used more as a condiment, adding just a teaspoon or two to most dishes.